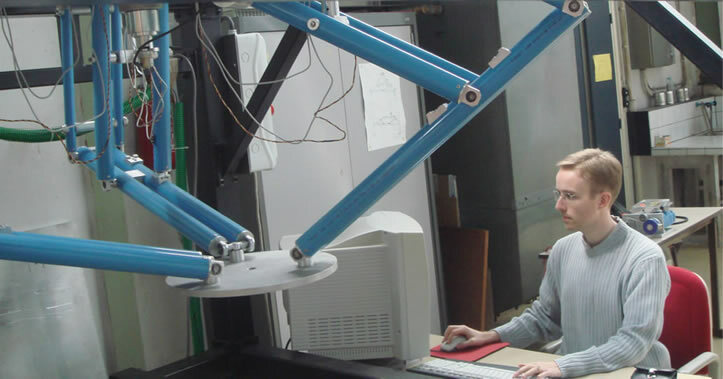 Over the last decades, researchers and companies have been attracted by the idea of creating new parallel manipulators. Such a mechanical architecture divides the manipulated load between the several legs of the system and, as a result, each kinematic chain carries only a fraction of the total load. Thus, it makes it possible the creation of mechanical structures with higher rigidity, containing movable links having relatively small masses. Many industrial applications of these manipulators in the electronics, food and pharmaceutical sectors, or in aeronautics or medical devices are well-known. However, parallel manipulators have also some drawbacks, such as a limited workspace, more constraining singularity loci or a high coupling of kinematics and dynamics. Full-decoupling, i.e. the decoupling of the displacements in relation to all the degrees of freedom of the platform. Despite rather encouraging results, it is not easy to develop a simple parallel architecture with fully-decoupled motions whilst conserving its principal advantages: a greater rigidity of the structure with light links. In order to solve this problem, we proposed a compromise between the decoupling of the movements and the architectural characteristics of parallel structures. In other words, we changed the statement of problem: it is not essential that parallel architecture be fully decoupled, it can also be partially decoupled but it is important to obtain a mechanical architecture with important payload. 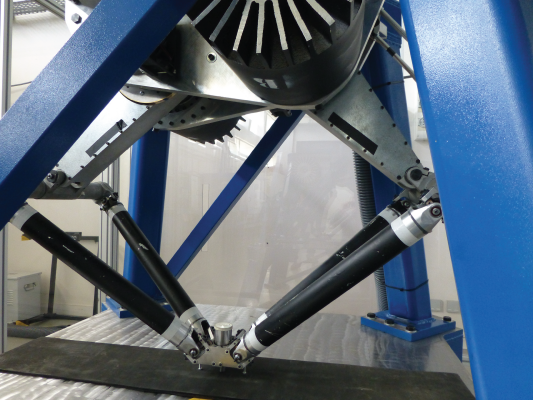 This problematic has led to the creation of a new family of decoupled parallel manipulators, the PAMINSA manipulators (Fig. 1). Fig. 1. CAD representation of the PAMINSA prototype. That new mechanism with four dof (3 translations plus one rotation around the z axis) was designed through the use of pantograph linkages. It allows the partial decoupling between the horizontal displacement of the platform (translations along x and y and rotation around z) and its vertical translations. 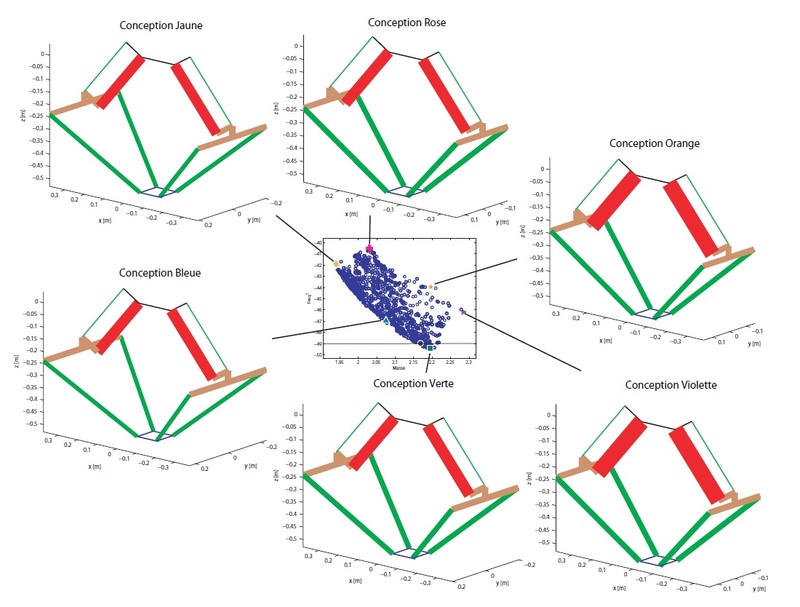 The simplification of the vertical control based on linear input/output relationships. In order to validate the results, a prototype has been designed and manufactured at the INSA of Rennes (Fig. 2). Fig. 2. Prototype of PAMINSA. The actuator for linear vertical motions carry all the payload. Fig. 3. Input torques of PAMINSA ((a)-(c) for motors carrying out the horizontal motion; (d) for the motor carrying out the linear vertical translations) during a loaded and unloaded trajectory with a payload of 20 N.
Nowadays parallel robots are used more and more in high-speed pick-and-place operations. The drive for higher operational speeds and higher payload-to-weight ratios is shifting their designs to more lightweight architectures. The fastest industrial robot, the Quattro by Adept Technologies Inc., reaches more than 15 G of acceleration, allowing up to four standard pick-and-place cycles to be performed per second. However, as for all high-speed mechanisms, vibratory phenomena appear that worsen accuracy and dynamic performance. This crucial issue prevents from using high-speed parallel robots for special tasks that require accuracy, e.g. as assembly of electronic components. Several robot architectures for high-speed operations have been proposed in the past decades. Many of them have four degrees of freedom (DOF): three translations and one rotation about a fixed axis, i.e., a Schoenflies motion. Some simple operations need only two translational DOF in order to move a part from a working area to another. Therefore, several robot architectures with two translational DOF have been proposed. Among them, those that have the capacity to fix the orientation of the platform via the use of a planar parallelogram (also called a Pi joint) are necessary in numerous operations. However, most of the proposed architectures are not stiff enough along the normal to the plane of motion. In order to overcome these problems, a new Delta-like robot, named the Par2, was proposed. This robot has the following properties: all the elements of the distal parts of the legs are only subject to traction/compression effects. This leads to a lighter structure with better acceleration capacities. The authors successfully built a prototype that can reach 53 G. However, even if its acceleration capacities are impressive, its accuracy is poor. This phenomenon can be explained by the complexity of the architecture composed of four identical legs among which two of them are linked by a rigid belt in order to constrain the motion of the moving-platform. As a result, this robot is more subject to parasitic effects that are difficult to identify and can decrease its accuracy. Moreover, its Cartesian workspace is rather small because the robot has four legs. The development of the robot IRSBot-2 (Fig. 4) is a part of the French project ARROW. Note also that the IRSBot-2 is patented. Fig. 4. 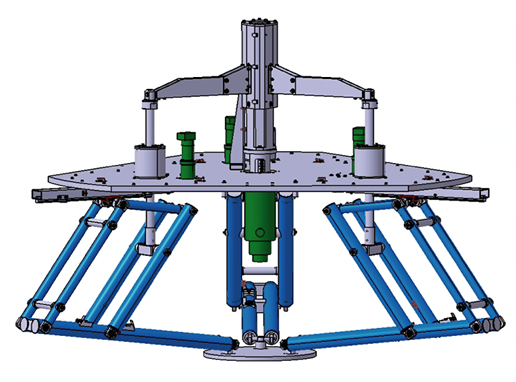 CAD view of the IRSBot-2 prototype. As compared to planar architectures with 2-translational DOF robots for which each element is subject to bending constraints along the axis orthogonal to the plane of the movement, the distal links of IRSBot-2 are only subject to tension / compression / torsion constraints. For the IRSBot-2 robot, all the flexion constraints are moved into the parallelogram (proximal links), which increases the intrinsic stiffness of the architecture. Its dynamical performances can be improved by decreasing its mass and its precision can be improved by reducing the bending of its elements. As compared to the Par2 robot, the only spatial architecture robot with 2-translational DOF that can be found in the literature, the IRSBot-2 (i) is simpler, and therefore less subject to uncontrolled parasitic effects, and (ii) has a larger workspace, since it has only two legs. In order to validate the theoretical results, a prototype has been designed and manufactured (Fig. 5). 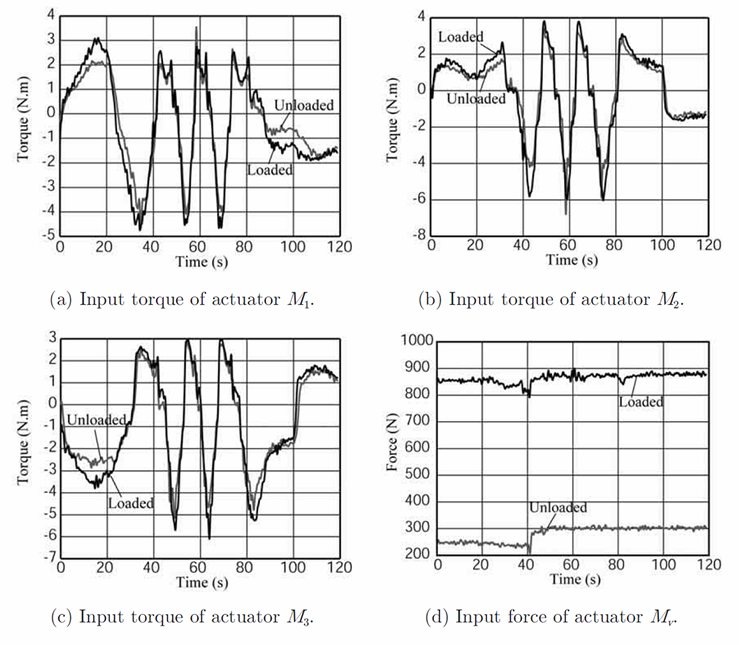 Its design parameters have been optimized thanks to an optimal design procedure based on the computation of its dynamics and vibratory performance (Fig. 6). Fig. 6. Pareto-optimal solutions for the design of the IRSBot-2 prototype. Its deformation under a load of 20 N in the direction orthogonal to the place of motion is lower than 120 microns in its operation workspace. C. Germain, S. Caro, S. Briot and P. Wenger "Optimal Design of the IRSBot-2 Based on an Optimized Test Trajectory," Proceedings of the ASME 2011 International Design Engineering Technical Conferences & Computers and Information in Engineering Conference IDETC/CIE 2013, August 4-7, 2013, Portland, Oregon, USA. C. Germain, "Conception d’un robot parallèle à deux degrés de liberté pour des opérations de prise et de dépose," PhD thesis, Dec., 2013, Nantes, France (in French). manipulability impacted by the under-actuation of the robot's carrier drone. To overcome payload limitations, some studies have examined co-manipulation between several quadricopters in cable transport applications. However, the cables can only be loaded in tension, which limits the handling area to the space located under the drones and the use of such systems to perform tasks in interaction with the environment in restricted spaces. Such a flying device can be seen as a parallel cable-driven robot whose actuators have been replaced by quadricopters. A wide choice of leg topology, as for any parallel robot, which can drive to create robots with very diversified performances. Fig. 7. 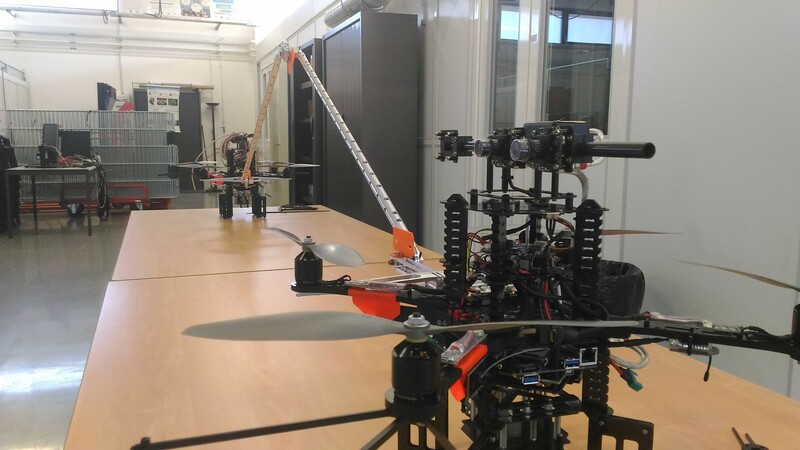 Prototype of aerial parallel robot. used to control them, such as backstepping, require a dynamic model decoupled from which each subpart can be controlled at differente dynamics. The decoupling of the dynamic model of the aerial parallel robot is not even impossible without neglecting certain terms. It is therefore necessary to propose strategies adapted to this new type of mechanisms. The aerial robot controllers are based on the use of the dynamic model. For the robot being able to fly, it is thus necessary to have a good knowledge of this model, knowledge that can only be obtained by identification. The problem is that to identify the model dynamic, it is necessary to make the robot fly, which is antagonistic with the previous sentence. How to obtain an identification of the dynamic model of the robot in this case? strategies to reconfigure parallel robots through the singularities to make them more versatile. See the page of the project RobEcolo.